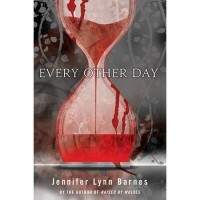 Every Other Day is an actionpacked, fast read that had me wanting to keep reading to find out EVERYTHING! There's a whole lot of mystery surrounding Kali's mother and also about what exactly it is that Kali is. Cause it's not really normal for a girl to turn into a predatory, self-healing zombie-killer every other day. I really felt for Kali. She's never had friends before and isn't on the best of terms with her father, the only parent she has left. And seriously, I guess the whole supernatural-killing thing can be traumatic even if you do have a happy life outside of it. Kali deals with it all pretty well in my opinion and I love that she's a strong girl. And I also loved that although she's hesitant at first, she learns to let other people in. I also really liked both girls that become Kali's friends and I love that they are both well-rounded characters! Also, I was pretty impressed the author didn't go for the obvious love-interest, because looking back that probably kind of would have ruined the story. And I liked that the romance that did appear didn't take over the whole storyline. I was shocked and horrified along with Kali when she finds out more about herself and her mother and I don't want to give anything away, but what Kali turns out to be? BRILLIANT! I'm actually really hoping there will be a sequel someday, because I'm dying to find out more and to see what happens next for Kali and her friends!